” As I said last week, these reports were very concerning and it is a great relief to have had full assurances that the stories were false and should never have appeared. I am grateful that the prospect of the severe offence that would have been caused has now abated”. 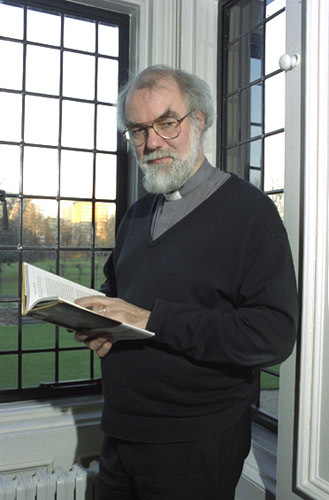 -Rowan Williams on the blatantly false stories concerning an Anglican Diocesan bishop in Nigeria. Does this not tell us that the Archbishop of Canterbury should pause before allowing his name to be used by the Anglican Communion Office and their strategic press releases? Even this press release came out during House of Bishops meeting in New Orleans and there was the communications director walking about newsroom and he never passed this press release out? Wonder why? Why didn’t the ACO following journalistic standards before pulling the Archbishop of Canterbury’s office into the unfortunate media story that turned out to be so false? Did they allow their own prejudices to block their judgment? We do wonder. Did they assume that since the bishop is Nigerian, it must be true? What does that tell us about those who are running the media ops in London? That we’re all one big happy family? This entry was posted in Anglican News, Archbishop of Canterbury. Bookmark the permalink. This matter exemplifies (at least for me) the spiritual and intellectual poverty of TEC. These folks assume that all Nigerians are bigots. They have no understanding of what Nigerian or other African Christians believe (nor do they seem to care). They are ignorant of the facts concerning the Afro-Asiatic context of the Bible. The intentionally cause gender confusion, lying about the binary male-female worldview of the Bible. They advocate female priests because that serves their cause. They justify their gender confusion by pointing to “civil rights” and yet no constituional amendment has been passed granting equal status under law to homosexuals. I could go on and on, but does anyone really care?